Traditional retail growth in Russia is much slower: about 5-7 percent per year. But for the time being, the share of online sales as a percentage of total turnover of retail sales in Russia is negligible: 1.6 percent. This is much lower than in other major European countries; in the UK, for example, it is more than 10 percent. 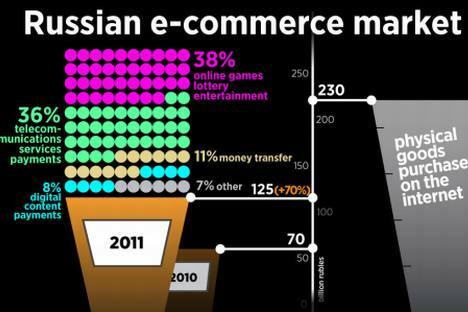 Only in Moscow, where the share of Web sales is around 20 percent, does volume approach the global average. More and more though, large retail chains operating in Russia recognize that online stores are a full-fledged opportunity for sales. For example, last year the share of online sales for the Euroset mobile phone retailer increased from 1.5 percent to almost 5 percent. For individual product groups, a company's share of sales over the Internet can reach up to 15 percent. Representatives of Euroset believe that over the course of five years, the share of Internet sales will reach 20 percent. M-Video, one of Russia's largest sellers of electronics and home appliances, reported that online sales in 2011 increased by 90 percent. The company expects that by 2015 online shopping will be responsible for up to a quarter of revenues. According to studies done by OZON, one of the largest online retailers in Russia, the most popular products on the RuNet are clothing (25 percent), electronics (15 percent), books (15 percent), cosmetics (13 percent), products for children (9 percent) and music and movies (8 percent).